Any advice on how to store ropes? I've heard different people say different things, some say hang them in loops others say its ok to loosely stuff them into a sack. So long as they're not tightly coiled and they're in a cool, dry place out of sunlight, I don't think there will be any difference between your two prospective methods. I think they can get all like twisted and kinked if you store them badly. The CNCC site has more about rope- check it out. Wow, that's pretty comprehensive advice! Cheers Chris....think that answers my question pretty well! one point about ropes wound in coils and ropes stuff in sacks, or packs....coiled ropes do develop twists and turns and bends from being coiled and uncoiled when used in vertical pits....heck, whaddawe expect!, we twist it one way building the coil from the inside out and then we take it apart from the inside!! !.............but; hanging it in a freefall pit will straighten out the kinks in the ropes and in you!! !..........i think ropes can be best stuffed sometimes and best coiled at others.......fer the usual 150 to 90 foot length (25 to45 meters) or so i think coils are the best way......you can drap them around your torso in the bigger passages and dragg'em behind you in the smaller ones......well coiled they will slither thru tighter spots than the same rope stuffed in a bag.....and, the most important reason for only using coils of rope in caves are in photography........what loooks better, coils of rope around your shoulders or at your feet or a pile of non-descript bags?...HA, no question about that!! Ropes will last longer if you carry them in a proper bag as its not very good dragging them over sharp rocks and stuff. And if your doing SRT or something you need them in a bag so you can hang 'em below you. Think thats ok for easy trips but too damaging on long, hard trips. Huw, that rope around your neck looks suspiciously like dynamic rock climbing rope to me - if it is you should be aware that it's likely to get ruined and shagged really quickly in a cave environment - the sheath on dynamic is engineered as part of the rope's shock absorbency and hence has a lot of "slip" to it - this allows grit and miniature calcite crystals inside the kernmantle and is insidious and highly damaging; static rope is COMPLETELY different and is the only suitable rope for use underground - of course there's nothing stopping you from using your old, soon to be retired, dynamic rope (or perhaps it belongs to someone else) but you should keep a damn close eye on it and certainly not use it for climbing again, especially if it gets covered in mud etc..
You could just ignore the above, I suppose, but for your own sake you really ought to get some static rope, Huw. Leave the colourful rope on the surface for the poseurs/climbers to ponce around with. In fact, on looking at the picture more thoroughly, I guess you're using Lanex Altea but I could be wrong (and probably am!). a.) Its not my rope.....i carry my own ropes in bags. b) Dynamic ropes do have a place in caving for climbs and things....static is for SRT. c.) In a very easy (i.e. 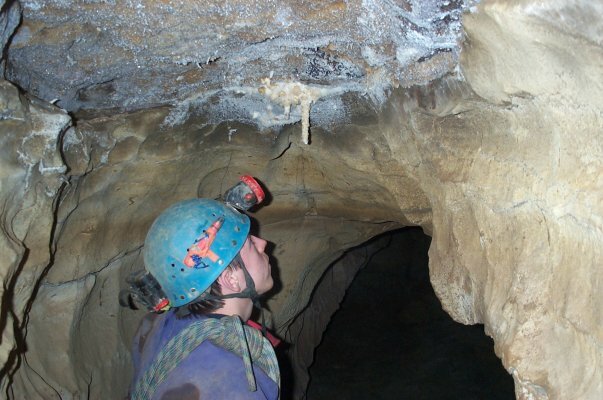 mainly walking) cave like the one in the photo (Aggy) not much damage is going to be done. d.) I do have my own static ropes! If you think you should use static rope in potential high fall factor situations you are wrong.....but then its your choice i guess! Huw, you are right; judging by your response you are also much more awake to the various issues concerning rope(s) than many others one meets underground - so there's no more to add. Eyecave - It really is easier to use rebelays and deviations you know! you can avoid water and use thinner ropes. Chris - fair enough, i agree people do need to be aware of the difference between static and dynamic ropes. I have prussiked up a 30 metre dynamic rope *boing boing*, but that was only because it was up an aven which had been freeclimbed the week before, was rigged with a static to descend! Not a reccomended experience! It takes so much longer! Huw, here in TAG the water temp is 52 or better (hot water!!) and a lot of the wet caves have a lot of dry passage.....so, if you have been drycaving in a wetsuit the pit is a refreshing cool break to the heat of the wetsuit.....if using a drysuit it is simply comfortable....so we don't really try to avoid the water unless it has a very large volume of water that would make it difficult to stand up in.. regularly.......now if the cave is a long one and only has one or two wet drops we will modify that and rig the pit deliberately dry......most TAG pits are freefall affairs and bolting can be done to accoomadate either scenario the cave explorers desire....the rack is not nearly as well-suited to passing knots as a petzl stop but it is a workable tool but not nearly as adroit......so, then another reason we like the single rope top to bottom affair.... .......(i use a mitchell system to climb, so passing knots is easy coming out of the pit).....i don't have any experience passing knots and using rebelays regularly, only sporatically!!....... :? Saw said karabiner last night and there ain't much left of it!!! Surprised they can rot so quick :?